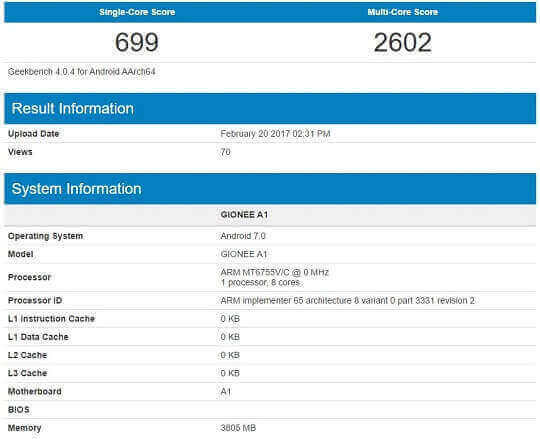 Days before its expected launch at MWC 2017 in Barcelona, Gionee's upcoming A1 smartphone has been spotted on Geekbench. According to the Geekbench listing, the Gionee A1 will be powered by an ARM MT6755V/C octa-core processor, and it would most likely be the MediaTek Helio P10 processor. It will come with 4GB of RAM, although no internal storage option has been officially revealed. The rumor is, it will come with 64GB of internal storage that is expandable up to 128GB via a micro SD card. On the single-core benchmark, the A1 received a score of 699. Meanwhile, on multi-core, it got 2602 points. The scores are pretty low, but we're guessing these wouldn't be the final points of the final version of the device. The upcoming Gionee A1 smartphone is expected to run on the latest Android 7.0 Nougat operating system. Other reports say that the A1, as well as the A1 Plus, will be a selfie-centric phone. It is rumored to feature a 5.5-inch Full HD display with 2.5D curved glass and Gorilla Glass protection, a 13-megapixel rear camera with PDAF and 16-megapixel front snapper. Both the front and rear cameras are expected to feature an LED flash. The Gionee A1, along with its Plus variant, is expected to be launched on February 27 at MWC 2017.